Oliver Reed isn’t wasting any time. He has work to do, and he’ll be god-damned if he’s going to let anybody get in his way. The work, of course, is drinking, and in the Christmas scene from 1975’s film adaptation of The Who’s rock opera, Tommy, he does more than his fair share. The camera whirls through streamers, tinsel, and lights like some drunken kaleidoscope, trying its best to track Ann-Margret through the chaos and revelry. But inevitably, it keeps landing on Reed, tipping a bottle vertical and pouring its bitter brown contents down his throat like it’s a prescription, like he’s swallowing barium and can’t stop long enough to register the taste, the texture, the chalky nightmare filling him up slowly from the bottom. Like most scenes in Tommy, the Christmas party only lasts about four minutes. It’s a musical—there’s another song coming up, preferably sung by someone whose vocal register improves on Reed’s, whose flat, bloodless intonation is more befitting of a drunk uncle with a head cold droning along to “Come All Ye Faithful” at midnight mass than a legendary actor billed above Elton John and Roger Daltrey on the marquee. In this brief four minutes, Reed is able to put away an impressive amount of beer, even for a heavily built English man at a Christmas party. He finishes at least two glasses in addition to the deuce of Newcastle that he pounds like a frat boy at the beginning of the scene. And maybe it would be all fun and games, if not for the menace, the monstrous figure that Reed cuts through the quaint, mid-century cheer. He leans in close to Tommy, an adorable little boy with a salad bowl haircut sitting impassively in his new pedal car. As he leans in, screaming, “Tommy, can you hear me?,” we can almost smell him, can almost feel his hot breath on our faces, cigar smoke and stale beer and plum pudding mixing with the musk of his aftershave and the mustiness of his Christmas cardigan, moldering in a damp closet since last December. All warmth drains out of the scene. What seemed an exuberant display of cheer moments ago now creeps in on us, a claustrophobic tangle of streamers and dancing limbs and dead branches, the creeping foliage of the tinsel and garland tripping up our feet, holding us fast as he moves toward us. Even Ann-Margret, her presence once angelic, has been twisted into something terrifying, parroting Oliver Reed’s question to her son. “Tommy, can you hear me?” Here, Oliver Reed is a collage of every bad father, abusive uncle, and domineering boss who has haunted our subconscious minds from the Old Testament God to John Wayne in The Searchers. He is a nightmare. He is the sum of manhood’s lurking darkness incarnate. In 1997, my mother drove my brothers and me to Michigan, to spend Christmas with my father and my grandparents. We took these trips twice a year (six weeks in the summers, and either Christmas or the week after Christmas, depending on which parent’s turn it was). My mother would never make it farther than Lexington, Kentucky, the halfway point between Lansing and Atlanta, where we’d meet my grandparents at the same McDonald’s off Interstate 75. There, the three of us would change hands in some bizarre sort of tight-lipped, overly polite, Midwestern hostage exchange. This trip was different—my grandfather, Vern, was in the final stages of lung cancer, and neither he nor my grandmother was in any position to drive over 900 miles to meet us. I’m not sure if the adults making these arrangements understood that this would be the last time we would see our grandfather. I imagine they must have, but it didn’t occur to us—to me, at least. I knew he was sick, knew he was very sick, in fact, but this sickness existed in the abstract. Vern had always been there. He’d been there far more than my father ever had, in fact, he and my grandmother picking up the considerable slack he’d left behind as a parent. The idea that he would be gone, and that he would never come back…on some level, I understood it, but I was somehow unconvinced that it could actually happen. Much like you know you’ll have to return to school at the end of the summer, but can’t possibly conceive of the realities of text books and desks and cafeteria meals from your vantage point in mid-July. I’m not really thinking about whether my grandfather is dying. I’m too busy being fascinated at the idea of my mother and father being in the same room together, an event that had last occurred so long ago that I couldn’t even reassemble a mental picture of it. 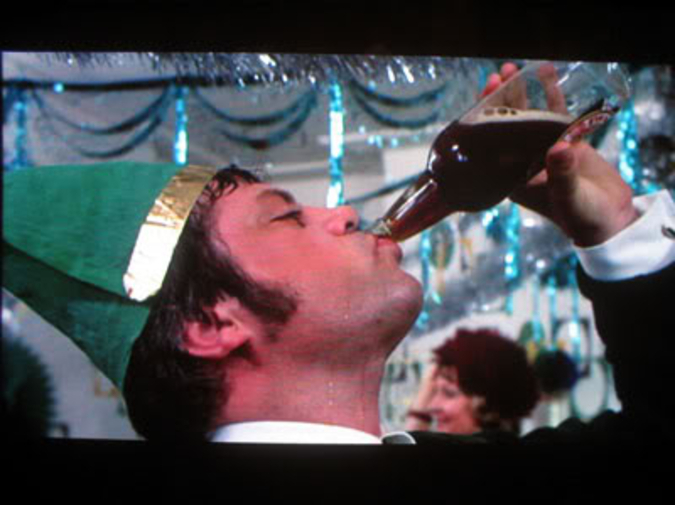 Walking into the kitchen at one point during the Christmas celebration, I catch my father tipping back a Budweiser, filling his throat like Oliver Reed (an association I won’t make for years, but that I now find inescapable). This angers me. Maybe because he is my father, and everything he does angers me. Or maybe because I am in the middle of a short-lived religious phase, experimenting with moral sanctimony in much the same way other kids my age areexperimenting with drugs and alcohol. He’s defensive about his drinking the way he’s defensive about each of his many shortcomings—his long lapses in communication, his inattentiveness when we are together, his habit of making me feel guilty for things that could never rightly be blamed on a five, seven, or ten-year-old. I’m old enough now to begin understanding my father as imperfect, to understand that my relationship with him, like any relationship, goes both ways. More than that, I’m beginning to suspect that I receive less from him than I rightly should. Later that night, during a quiet moment after unwrapping presents, I watch my grandfather collapse in the doorway of the bathroom. He is wearing khaki slacks and a flannel shirt. I am sitting on a green sofa on the far side of the living room, drawing a picture of a red-scaled dragon that I’ve been writing a story about in my notebook. The angle of the house is such that I’m the first to see him, but I can’t put the words together to speak. Soon enough, the adults realize what is happening, and they push me, my brothers, and my half sister into the spare bedroom and close the door while the paramedics attend to my grandfather. We can’t see what’s happening, but we can hear it—vibrations against the door, the squawking of the paramedics’ radios, questions shouted and answers murmured in uneasy, quavering voices. The bedroom is directly across the hall from the spot where my grandfather collapsed—this means that not only could we hear almost everything that was happening as the paramedics revived him, but that we had to step around his prone body on our way into the room. It’s a traumatically stupid choice on the part of the adults present, but one I’ve come to forgive them for, understanding now how difficult it must have been to make rational decisions in that moment. I spend an eternity in that room with my three siblings—my sister is only six, and we take turns trying to assure her that everything is going to be okay. It’s something we’ve heard repeated, something we’ve heard adults say to us, something the hero is told in the movies at a vulnerable moment, a mantra aimed equally at the one who speaks it and the one who is listening. Anyone who’s flipped past classic rock radio understands Tommy’s basic premise: deaf, dumb, and blind, young Tommy transcends his disability and a traumatic childhood to become a world-renowned pinball champion (and later, following the unimpeachable logic of 1960s psychadelia, a cult leader). The film version tweaks Tommy’s back story a bit. In the movie, his father, a WWII veteran, returns from the war to find his wife Nora (Ann-Margret) in bed with Oliver Reed’s Frank Hobbs. In a fit of rage, Reed murders Tommy’s father while the boy looks on, and the ensuing attempts to silence Tommy as a witness create his psychosomatic condition. The Who’s album tracks much the same story, except that Tommy’s father murders his wife’s lover. He, not the Oliver Reed character, goes on to enact the various abuses that poor Tommy endures. Maybe the filmmakers consider this too potent a psycho-sexual cocktail for 1970s film audiences. Or perhaps they wanted to justify casting Oliver Reed, who wouldn’t have been particularly believable as Roger Daltrey’s father. Or maybe the change was made to allow for a happy ending: the film ends with Tommy returning to the spot where he was conceived, a reunification with the spirit of his father, who has been his subconscious guide through this spiritual journey. The Who’s original, canonical ending has Tommy returning to deafness, blindness, dumbness, but reaching a higher plane of consciousness as a result. It’s a happy ending in its way, but perhaps too obscure, too existential, too influenced by songwriter Pete Townshend’s Buddhism for a mass film audience. The movie version, with Oliver Reed’s villainous step-monster and the martyred war hero co-existing, allows Tommy to resolve his daddy issues through compartmentalization. He has two fathers: one an instrument of hate, the other a blank space on which he can project his love. The night my grandfather collapses before my eyes, my siblings and I have an unlikely rescuer. My father, elected to this position for reasons I still don’t fully understand, loads the four of us into our grandparents’ van and takes us to a skating rink across town. He buys us king-sized Styrofoam cups of Vernor’s from the concession stand, gives us quarters to feed the blinking neon machines of the arcade, rents us skates and leads us out onto the ice. Transplanted from Michigan long ago, and almost never back for more than a few days during the winter, we’re pathetic, sliding nervously around the rink, waving our arms and falling on our butts. But my father—I never expected it—is an amazing skater. He moves across the ice effortlessly, gracefully. He spins around backwards and holds my sister’s hands, pulling her along on her little pink training skates. He slides beside me, trying to teach me to be confident in my strides, to keep my balance on the narrow blades. In the past, I’ve talked about this night as an outrage: my grandfather, suffering in the hospital, while my father carted us off and kept us in the dark. (Vern would live another few days, but we’d be back home in Georgia by the time he died.) But I don’t think this way anymore. I think that’s me, trying to construct a version of my past that’s easier to live with, a narrative that lines up with all that has come after. That night didn’t contribute to my idea of my father as irredeemable, so I had to throw it out. You can say a lot of things about my father, and one of the best (and, maybe, worst) is that he knows how to have fun. The truth is that I had fun that night. I wasn’t thinking about my grandfather, about death. My father gave me a gift, even if it’s the last one he ever gave me, even if it’s the only one he ever gave me that was worth a damn. He sheltered me. He kept me safe. He put his hands over my ears, told me to close my eyes, and held me tight against his chest.